Summary: Another summer monsoon developed off the front range near Colorado Springs and slowly made its way out to the Eastern Plains yielding another spectacular display of lightning. First stop was out my back door of a sunlit storm that looked more like it was raining fire than water. Then it was off to Peyton to intercept a storm that passed near Peyton, CO for about 30 minutes of spectacular lightning. I then chased all the way out to Matheson, then down to Rush and out to Punkin Center before calling it a night. The storms pretty much went into heavy rain mode and made it difficult at best to stop for further lightning shots. 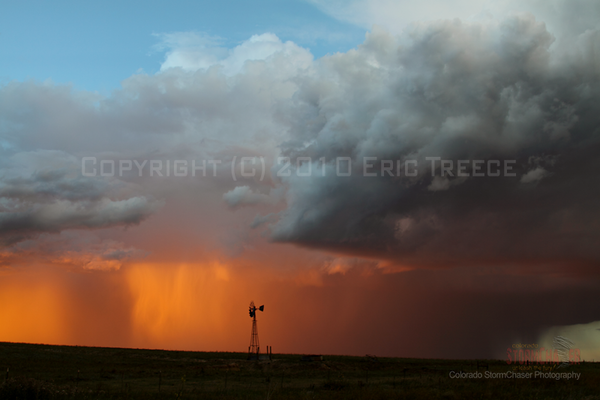 I called it a night around 0130……..
Storm near Elizabeth, CO at sunset.